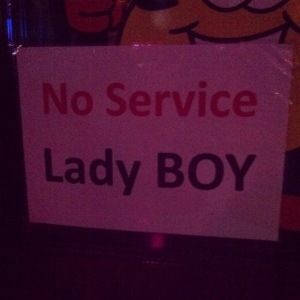 I was a bit surprised to see a “No Service Lady Boy” sign on the front door of a Bangkok bar, being from America, you just don’t see signs like this. Of course you see the “no shirt, no shoes, no service” signs in the USA, but not anything like this. So why no Lady Boys you ask? I asked as well. I was told that Lady Boys visiting the bar had become very popular with the male customers that frequented the bar- and that the Lady Boys frequently left with the male customers. The manager did not employ any of the Lady Boys and felt they were taking business out of the bar. I found this logic flawed on so many levels, the most basic being that if your bar is losing customers to another bar/option, don’t ban that option, re-look at your bar (mind you, the bar was empty at happy hour on a Friday night). Or, create such a fun bar that customers won’t want to leave, even without the ‘option’ of the Lady Boy. The sign shocked me, but after speaking with the manager I understand the sign, the lack of logic and that I won’t be frequenting that bar. This entry was posted in Bangkok and tagged Bangkok, Farang, Lady boy, Thailand. Bookmark the permalink.